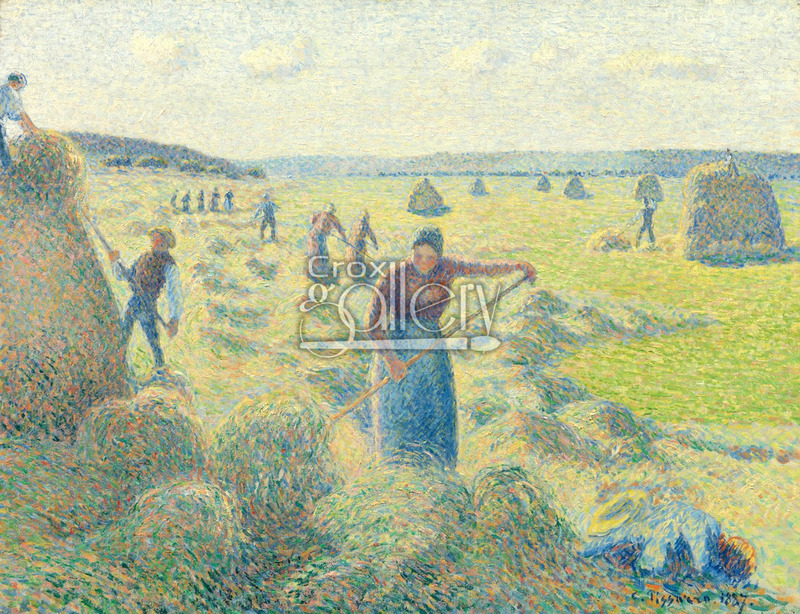 "Hay Harvest at Eragny" by Pissarro, Oil Painting Reproduction. 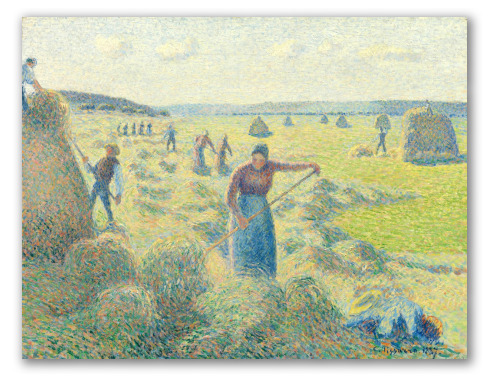 "Hay Harvest at Eragny" was painted by Camille Pissarro in 1887. Eragny is the rural village where Pissarro spent the greater part of his life, from the time when he established his family there in 1884 until his death in 1903. The different landscapes captured the mind of this Master: among the hundreds of paintings inspired by this village there is a display of all kinds of colorations, shades, climates and times of day. In this work, Pissarro uses clear, citric tones, applying the paint according to the methods of pointillism. The shadow seen in the first plane provides contrast to the illuminated, seemingly-endless landscape; the farmers' poses are jovial, demonstrating the intrinsic joy found in their labor. "Hay Harvest at Eragny" is currently displayed in the Van Gogh Museum, Amsterdam. Original size: 55 x 66cm.